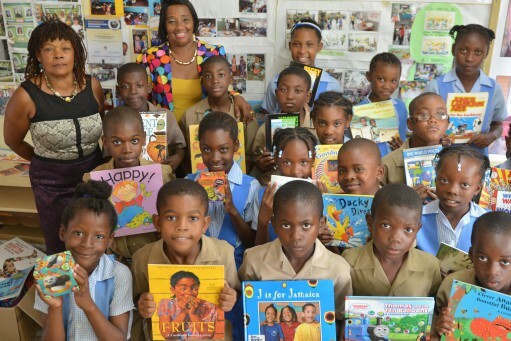 On Wednesday April 30 I delivered more than 1,000 books to Cacoon School in Hanover Jamaica, to set up the school library. As you can imagine, the children and staff were absolutely delighted. The excitement on the faces of the children as they picked up some of the books we had unpacked for the photograph was a joy to behold. Teachers, too, were very excited as they found books that they urgently needed to support their class work. The books, which are valued at $JA 1.5 million, include basic readers, children’s story books, general information and reference books, black history books, dictionaries, puzzles, poetry and fiction. Also included are quantities of sturdy board books for the younger children who are just starting to learn to read. All the books are in first class condition and many are brand new. This day was the fulfilment of a promise I made last year when I first revisited Cacoon – where I went to school as a young girl in Jamaica more than 50 years ago –and saw how great the need for reading resources was. When I came back to England I launched an appeal via email and social media, and I want to say a heartfelt thank you to Geraldine Thomas and members of the congregation at Birches Evangelical Church; Elenor Carroll; Tony and Rose Kelly; John Tyrell; Marisol Grandon; Margot Lambert; Shelley Bishton; Derek Bishton; and Tamsin Bishton who donated books. I also want to make a special mention for Beverley Johnson at JLB Shipping who organised transport to Jamaica. Special thanks also to my husband Derek Bishton for driving to Kingston to pick up the books, and to my son Tim Crooks for lending us his truck to transport the books from the Beach House to Cacoon school. So many people have contributed and a lot of hard work has gone into making this donation possible, but I am so thrilled that I have been able to bring a library to my old school up there in the hills of Hanover. I am determined to continue helping Cacoon, and I am also keenly aware that there are many other schools in Jamaica that need to be helped in a similar way. If you would like to help me with this project in any way at all, please get in contact.